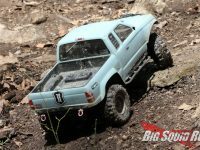 underdrive gears « Big Squid RC – RC Car and Truck News, Reviews, Videos, and More! You are browsing the "underdrive gears" tag archive. When it comes to scale crawling hop-up discussion, over/underdrive gears never fail to confuse noobs. What does “overdrive” even mean? Will it hurt your truck? Click the “Read More” below to get the skinny on a mod that can help your Axial truck get its Billy Goat on.